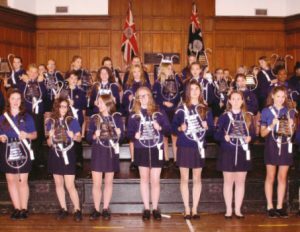 The team at ‘Mayfield Bell Lyres’ are no strangers to receiving requests for adaptations to their musical instruments, but the phone call they received from 1st Barnet Boys’ Brigade and Girls’ Association took them by surprise. They were asked if they were able to design and manufacture a mini-bell lyre, with only 5 notes, specifically wanting this modification because the band also play bugles and this particular note configuration suited their musical scoring. But then came another surprise – it wasn’t just one mini-bell lyre they wanted, but 50! The team love a challenge so they immediately got to work on designing the bell lyre for the band. Chief Engineer, Tony Cutts, met with the Company to check if the customised design met with their approval and having received the ‘thumbs-up’ they began to make another 49! In the space of 2 months, the instruments were ready for collection. The end result is a beautiful and very lightweight bell lyre, perfect for the younger band members. It can be easily carried by hand or with the use of a sling. It retains the quality workmanship that is associated with Mayfield instruments, with each aluminium note meticulously tuned for perfect pitch and harmonics. The same size bell lyre can actually accommodate up to 7 notes. To demonstrate just how Mayfield instruments can be personalised, Tony and Simon have since designed a mini bell lyre with red painted woods, blue back plates and white felts – very patriotic! The Mayfield team are very proud of their latest invention and have given it the angelic name of “Seraph”.